Situated on the central east coast of Scotland, the relaxing rural scenery of North East Fife provides variety from the historic splendour of St.Andrews and the picturesque harbours of the East Neuk of Fife. A Royal Palace in Falkland, a Folk Museum in Ceres, a National Trust Mansion House near Cupar and much more. CUPAR flourished as the County Town of Fife up to 1975, when local government reorganisation took place and today it has local offices as part of Fife County. 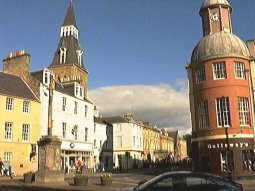 The town of Cupar is one of the oldest burghs in Scotland and although the earliest known charter dates back to 1382, it was certainly a prominent burgh long before then. 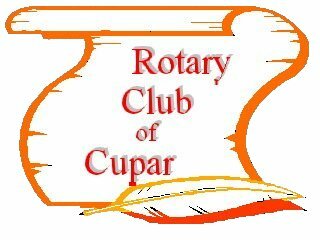 Cupar has always benefited from its central location in the Howe of Fife as the converging roads from Falkland, St.Andrews, Dundee and Edinburgh made Cupar the natural place for the Thanes of Fife to build their castles over one thousand years ago. Records date back to 1239 confirming Cupar as the Seat of Justice and the early Sheriff Courts were held on the Moat Hill. This connection with the law give rise to the old proverb 'He that will to Cupar maun to Cupar'. The old Parish Church in the Kirkgate was originally built in 1415 and only the tower and spire retained when it was rebuilt in 1785. In the Parish grave yard lie the heads of two Covenanters and a hand of the infamous Hackston of Rathillet. In 1679 when the Archbishop James Sharp was dragged from his coach on Magus Muir and murdered by the Covenanters, Hackston of Rathillet sat impassively on his horse watching the gory proceedings. For his involvement in this murder he was cruelly executed in Edinburgh in 1680. In Cupar any hangings would normally take place at the Fluthers, and the last public hanging was held on the 5th July 1852. Religious strife has often played a major role in Scottish history and at the time of the Reformation two opposing armies faced each other on Cupar Muir. The army of the Lords of the Congregation who supported John Knox and the Reformers gathered to challenge the Queen Regent's army who were intending to march on to St.Andrews. The challenge proved effective and a treaty was signed on the nearby Hill of Tarvit. 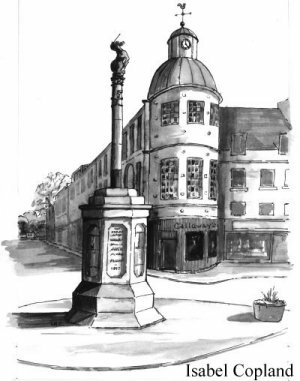 The Mercat Cross once stood on this hill but it was returned to its proper place outside the Town Hall to mark Queen Victoria's Diamond Jubilee Celebrations in 1897. To the north of Cupar a 95ft high column known as the Mount, commemorates Sir John Hope of Rankeilour, the 4th Earl of Hopetoun. The Mount was also the birthplace of the famous David Lyndsay who served at the courts of James IV and James V. He is best known for his satirical play 'The Three Estates' which was first acted in Cupar in June 1535. In the build up to the Reformation the play was well received as it poked ridicule at the role of the Church. Cupar was naturally the centre for many industries which benfited in the late 1880s from the rail link between Dundee and Edinburgh. In 1926 Scotland's only sugar beet factory was built outside Cupar. It closed down in the 1970s and the agricultural market near the station closed in early 1994 thus ending Cupar's role as the main market town in Fife stretching back at least seven hundred years. Even though the importance of Cupar has diminished in recent years the town still offers many excellent leisure facilities including, golf, rugby, cricket, football, swimming, tennis,and bowls for locals and visitors. Scotstarvit Tower stands high high above the Howe of Fife commanding an excellent view to the Lomond Hills. This 16th century keep was bought in 1611 by Sir John Scott of Scotstarvit who was acknowledged as a great expert in cartography. In 1654 he published the first maps of all the counties and islands of Scotland. The tower was abandoned in 1696 and was eventually owned by the Wemyss family who owned Wemyss Hall- now named the Hill of Tarvit Mansion House. The original 17th century Wemyss Hall was designed by architect Sir William Bruc. In 1906 the wealthy Dundee jute owner Frederick Bower Sharp commissioned archiect Sir Robert Lorimer to redesign the house for his private collection of European paintings, Flemish tapestries, Chinese porcelains and French and Regency furniture. Lorimer also designed the layout of the gardens, with a walled garden to the north and terraces falling away to the south. In 1949 the Hill of Tarvit Mansion House was bequeathed to the National Trust for Scotland who continue to welcome the public to view this impressive art and antique collection. North East Fife is mainly an agricultural area and the Fife Folk Museum at CERES has an excellent collection of old farming implements, tools and costumes which are a record of the way of life, in days gone by. The Museum is located in the 17th century Weigh House and adjacent cottages which stand beside the humped back stone bridge that Archbishop James Sharp crossed on his last journey to Magus Muir in 1679. The village green is an attractive setting for the annual Highland Games which are the oldest free games in Scotland. The memorial by the bridge commemorates the men of Ceres who marched to Bannockburn to support Robert the Bruce in his battle with King Edward's army in 1314.